Introduction: Adequate lymph node (LN) retrieval and examination is necessary for both accurate oncologic staging and patient selection for adjuvant chemotherapy, and the National Cancer Institute recommends examination of at least 12 LN to properly stage the LN basin. Laparoscopic colectomy has gained much popularity as studies have shown equivalent oncologic outcomes compared with open surgery. We hypothesize that obesity (BMI≥30) increases the risk of inadequate LN retrieval. Methods: The charts of patients who underwent laparoscopic right hemicolectomy for invasive cancer were retrospectively reviewed. Total number of LN retrieved, patient demographics, BMI, and years of surgeon experience were recorded. All procedures were performed by two board certified colorectal surgeons at a single university hospital during their first 5 years of practice post fellowship training. Laparoscopic right colon mobilization was achieved using a lateral to medial approach with intracorporeal vessel ligation. Patients with metastatic disease were excluded. Results: Forty-five patients met inclusion criteria. Mean patient age was 64.3 (± 11.7) years. Overall mean LN retrieval was 16.7 (± 7.5) nodes, and 78% of patients had adequate LN retrieval (≥12 LN). Mean BMI was 28.2 (± 5.1). 36% of patients were obese. The mean number of LN harvested among obese patients was significantly lower than non-obese patients (12.0 vs 19.3; t-test, p<0.001). Only 56% of obese patients had adequate LN retrieval, while 90% of non-obese patients had adequate LN retrieval (Fisher’s exact test, p=0.021). Additionally, surgeon experience was associated with LN harvest. 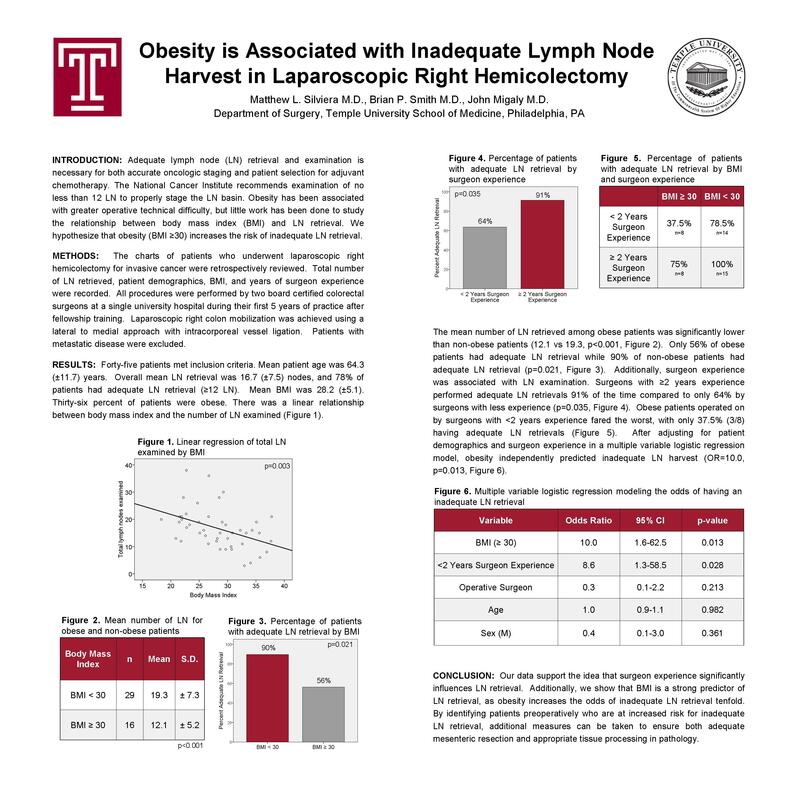 For each additional year of surgeon experience, patients were 2.9 times more likely to have an adequate LN retrieval (logistic regression, p=0.036).After adjusting for patient demographics and surgeon experience in a multivariate logistic regression model, obesity independently predicted inadequate LN harvest (p=0.013, Odds Ratio=10.0). Conclusion:Our data supports the idea that surgeon experience significantly influences LN retrieval. Additionally, we show that BMI is a strong predictor of LN retrieval, as obesity increases the odds of inadequate LN resection tenfold. By identifying patients preoperatively who are at increased risk for inadequate LN retrieval, additional measures can be taken to ensure adequate mesenteric resection.